Next Wild vs farmed fish: what should you choose? 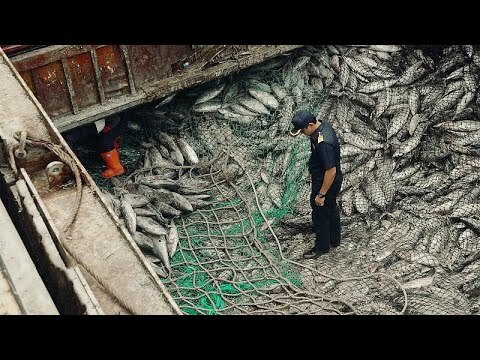 In a tightened up policing of their fishing industry Thailand has begun intercepting and inspecting fishing boats far out at sea this year, one of many new measures to curb its dangerously high levels of overfishing. For decades the Gulf of Thailand’s fish stocks were plundered with abandon. Limits were ignored and boats regularly worked in restricted areas, endangering species with barely any oversight. Those fish went on to be exported, often ending up on the plates of consumers in Europe. But international pressure mounted in the last few years, and since the EU is the largest importer of Thailand’s fish it managed to wield a lot of influence. In 2015 the EU issued a “yellow card,” warning the Thai government it would suspend its imports if no action was taken, and in January it was finally lifted and a “green card” was awarded. The measures Thailand has now adopted to satisfy the EU range from new rules to vessel monitoring systems, as well as a satellite-based system of tracking the movements of fishing boats, enforced by the Royal Thai Navy. Thai officials say Europe’s pressure has helped them to implement these reforms, convincing the fisheries to accept tightened control. “As the biggest importer of the seafood of the world, I think the EU is using its power trying to solve the problem. That’s why we’re not complaining about the yellow card at all. And the yellow card for us is like a wake-up call: OK, you know the problem, now you have to wake up and do something significant,” Adisorn Promthep, the Director–General of Thailand’s Department of Fisheries, told Euronews. “Since the yellow card was issued, the Commission and Thailand have engaged in a constructive process of cooperation and dialogue,” the European Commission, the executive arm of the EU, said in a statement in February announcing the lifting of the card. Thai seafood exports stood at 1.85 billion euros in 2017, Commerce Ministry data show, recovering to their 2014 level after a drop in 2015 to 1.6 billion euros following the European Union warning. About 9.9 percent of Thai seafood exports went to the European Union last year, versus 10.3 percent in 2014, ministry data show. Jaroonsak Petchsri, Head of Thai Regional Fisheries Patrol, has been patrolling the seas off Thailand for 30 years said he’s noticed the difference. “In the past, we didn’t really have much control over the fisheries… They were depleting the sea, harvesting fish big and small, removing it in spawning seasons. Now, with the new laws, these things have changed,” he told Euronews. Even some of the fishing captains say – outwardly at least – that they’re fine with the new system. “I agree that all the illegal fishing has to end. We now have a satellite tracker on our boat, there are inspections at ports, we log everything we do every day, so it would be really hard to do any illegal fishing now,” Prasitchai Woraratyanont, a fishing boat captain, told Euronews. Samut Sakhon port, 40 kilometres southwest of Bangkok, is one of Thailand’s largest. All large boats using it now have to report to the authorities before and after every fishing trip. Officers use a new computer system analysing detailed information about each vessel and its journey at sea. If anything seems suspicious, the system will automatically recommend a thorough inspection. “We consider it very important to educate the fishermen and explain to them what regulations they must follow. These inspections allow us to make sure everything is in order as far as the vessel, the crew and the catch are concerned,” Sagultem Peera, head of the Port in/Port out Centre told Euronews. And back at the Department of Fisheries’ brand new monitoring centre in Bangkok roughly 6000 fishing vessels, all equipped with satellite trackers, are watched around the clock. “We are receiving data on the speed and direction of each boat in real time. If a trawler has slowed down, fishing in a restricted zone, we’ll start the procedure to intercept,” Bundit Kullavanijaya, Head of Vessel Monitoring System workgroup, Thailand Department of Fisheries, said. Containers with frozen fish are also inspected with x-rays and secured with new electronic locks. Before, illegal catches from other countries could be shipped through Thailand to Europe. Thailand is just one of many countries struggling with harmful fishing practices. An estimated one-fifth of all worldwide catches are illegal, unreported, or unregulated — globally that’s 10 billion euros per year. Now foreign flag vessels are not allowed into Thai ports anymore unless their cargo is properly certified. “Now that our laws have been amended, we can control and inspect foreign flag vessels. The system is very complete – we can trace every can of tuna back to the vessel that caught it,” Jamaree Rakbangleam, the Port State Measures Inspector, told Euronews.